There are many different forms of gifts – just as there are many reasons for giving. A homemade present shows the recipient how important they are to you. Another gift may be given to someone you know out of a sense of obligation. In today’s verse, the Greek word for “gift” appears only 10 other times in the New Testament…and only when referencing God as the giver! The significance is that it is a reversal of the normal flow of gifts. God, who is the ultimate superior in the universe, gives His special gift to humanity, the inferior. Of course, this extraordinary gift is Jesus Himself. In II Corinthians 9:1-14, Paul conveys his happiness for the love of fellow Christians for each other and their willingness to give. But their relatively trivial presents, contrasted with the inexpressible gift from God, causes Paul to be overwhelmed with adoration and thanksgiving to the Father for the gift of His Son. Don’t let the busyness of the season remove your sense of gratefulness and awe for the Lord’s magnificent gift. 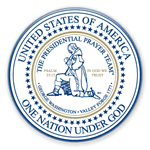 Let your intercessions be that America and its leaders will come to know God’s love for them through His greatest gift…Jesus.